G.I. Jobs magazine named the University of Colorado at Colorado Springs to its 2010 list of Military Friendly Schools, designating it among the top 15 percent of colleges, universities and trade schools for their work with veterans. The list was compiled through research starting in May during which the publication polled more than 7,000 U.S. schools. Those included on the Military Friendly Schools list offer additional benefits to student veterans. "We try to understand the needs of active duty military, veterans and extended family members and then meet those needs," said Dana Rocha, director of the UCCS office of military and veterans affairs. "The university's services range from helping someone with their application for military benefits and understanding the university's academic requirements to helping someone transition from a public service career to a career in the classroom through our Troops to Teachers Program." The list will be highlighted in the magazine's annual Guide to Military Friendly Schools and on a poster, both of which will be distributed to hundreds of thousands of active and former military personnel later this month. 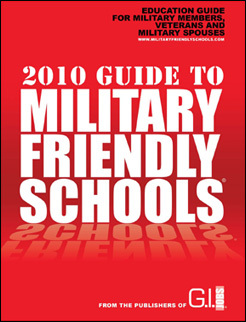 A new Web site, www.militaryfriendlyschools.com, also will launch in September with interactive tools and search functions to help military veterans in choosing schools.